Home Quality Comfort for You and with You for a great holiday! Property 2: Home Quality Comfort for You and with You for a great holiday! 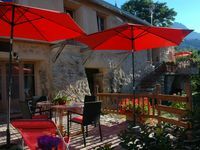 SUPER Gîte at the foot of DEVOLUY: PROMO from s6 April to m31 April = 450 € / week! Property 6: SUPER Gîte at the foot of DEVOLUY: PROMO from s6 April to m31 April = 450 € / week! Independent unusual cottage, quiet, countryside in kind, 2 people. Property 12: Independent unusual cottage, quiet, countryside in kind, 2 people. average mountain cottage, quiet and rest assured. Property 15: average mountain cottage, quiet and rest assured. Independente house, countryside, tranquility, nature. Property 21: Independente house, countryside, tranquility, nature. Cottage with Spa and Sauna "in the Menil Trieves Vercors"
Property 31: Cottage with Spa and Sauna "in the Menil Trieves Vercors"
Property 37: Cottage with Spa and Sauna "in the Menil Trieves Vercors"
This is a lovely apartment at the top of the hill overlooking Chorges. The neighbors are an international group. Everyone was so kind and helpful . Lots of suggestion and information for places to see and visit in the area. The apartment is very well equipped, perfect for 2 people. The terrace is a wonderful place to have morning coffee or evening cocktails or just spend time relaxing during the day! We spent a delightful week here.